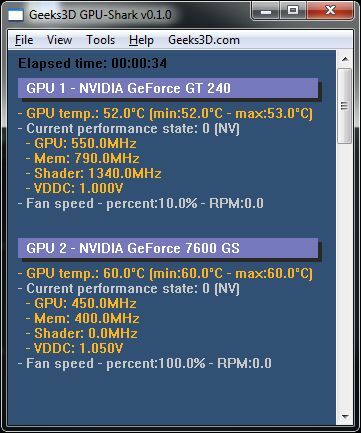 GPU-Shark is a new GPU monitoring utility for NVIDIA GeForce and ATI Radeon graphics cards. GPU-Shark is lightweight (the size of the exe is small – version 0.1.0: 180KB) and there’s only one file that doesn’t require installation (like GPU-Z). Why GPU-Shark and what’s the difference with GPU Caps Viewer ? GPU-Shark is mainly a test app for my GPU detection engine (ZoomGPU). This detection engine is used in all my tools (GPU Caps Viewer, FurMark, FluidMark, etc.). That helps me to quickly identify the situations where the detection engine reports wrong data in order to fix the engine. Don’t hesitate to drop a comment if you encounter bugs or other weird things. That’s a nifty util mate. Thanks. Here is a shot of my fanless 8800GT for your reference. I will upload shots of my 5850s later today. 3) Option to show selectable values, in an On Screen display fashion, under D3D and OGL. An on screen framerate counter with selectable refresh timing from 16ms to 2000ms would be nice. Yeah, they kinda beat the purpose of this util, but I am just throwing ideas. It wouldn’t be bad to have something to complete fraps and MSI Afterburner anyway. My laptop’s GeForce Go 7300 does not have much info for bus width ram type etc. It doesn’t work over remote desktop – window comes up very small and only has ‘elapsed time’ with no GPU info. 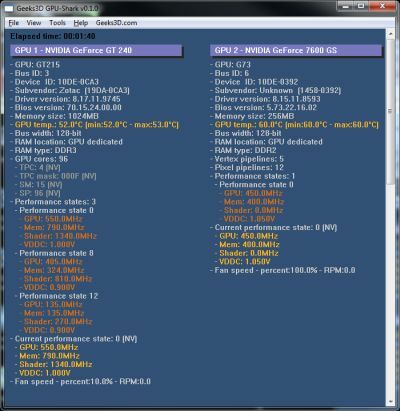 This is simple and efficient to get knowledgeable data about the GPU. I keep it in my CPU/GPU tool list. Hey there, love this tool, but have a problem with the new version – AVG flags it as the most severe level of identity threat (without any explanation, of course). Does AVG do so erroneously, or have you started collecting data in the background that you should not? @pla: certainly a false-positive from AVG (I have AVG and there’s no problem) due to the exe packer compressor I use to ship GPU Shark. Try the latest version available HERE. A font size option would be excellent. a GTX 660 TI, and GT 610. Reported memory usage is always an identical percentage on both cards. Impossible !!! In other words, both video cards always show the same percentage memory used in GPUSHARK.